August 17 marks the 76th anniversary of the legend of Azerbaijani singer Muslim Magomayev. Azerbaijan's baritone Muslim Magomayev possessed a unique baritone, high artistry, and spiritual generosity. The singer's voice was truly divine, beautiful and extraordinary. His brilliant and genuine talents conquered listeners all over the world. Muslim Magomayev was born into a musical family. 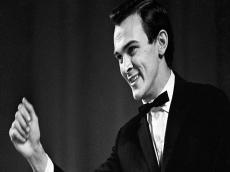 Magomayev became famous at the age of 19, after a great performance at the Youth Festival in Helsinki (1963). He also appeared in the famous Tchaikovsky Concert Hall in Moscow for his first recital. A very popular singer K. Shulzhenko wrote later, "The moment Muslim appeared, it became a huge event. He is greater than all the other singers. Everybody adores him." A training in the "La Scala" Opera Theater in Milan was very important stage in mastering his vocals skills. Muslim remained forever a supporter of the Italian singing school. He adored such great singers as Beniamino Gigli, Gino Bechi, Tito Gobbi, 'Mario del Monaco' and Enrico Caruso. In 1969 Magomayev gained a victory in the Song Contest in Sopot, Poland and also brought him the First "Golden Disc" in the Cannes Festival as 4.5 million of his records were sold out. At age of 30, he was one of the youngest recipients of the highest artistic title, People's Artist of the USSR. His repertoire includes more than 600 songs, and his discography includes 45 gramophone records and 15 CDs. Muslim Magomayev wrote songs, film soundtracks and music for theater performances. In addition, he played in films and acted as a host in television and radio broadcasts. He also loved to painting, but called it his hobby. In later life, Magomayev struggled with a serious heart condition. In 1998, "King of Songs" officially ended his musical career and gave only a few performances together with his wife. The legendary singer died of a heart failure in Moscow on October 25, 2008 and was laid to rest in Baku.